Few tourists visit Pakistan nowadays. I spent a few weeks there in the Fall of 2004, and found it to be a friendly, peaceful, very safe country. With a few exceptions, its lowland areas are of interest only for desert biologists and archaeologists, but the mountains up north are among the most scenic and diverse parts of our planet. Here are pictures from the trip; see also the text account. 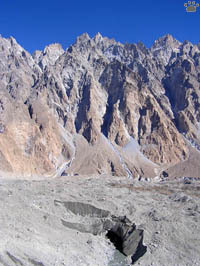 Karakoram Highway, and the only legal border crossing into China. 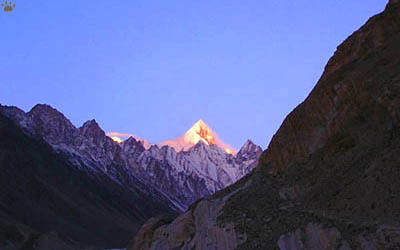 countless smaller peaks, such as this unnamed mountain near Sost. 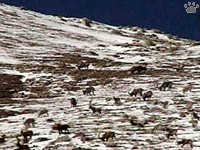 Ibex and wild sheep herds, Khunjerab Nat'l Park. 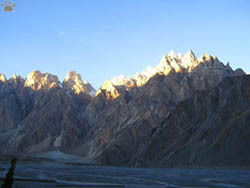 The Karakoram Highway (KKH) is the world's most beautiful road. 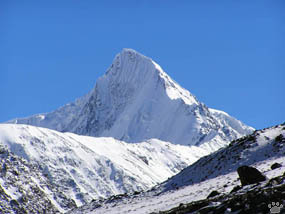 Its highest part crosses Khunjerab National Park. 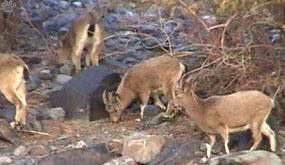 Huge herds of Marco Polo sheep (Ovis ammon polii) and Siberian ibex (Capra sibirica) can sometimes be seen there. 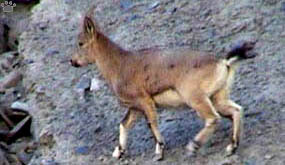 Siberian ibex, Khunjerab Nat'l Park. 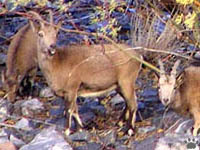 Siberian ibex, Khunjerab National Park. 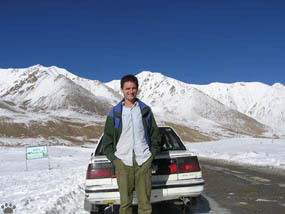 Khunjerab Nat'l Park. 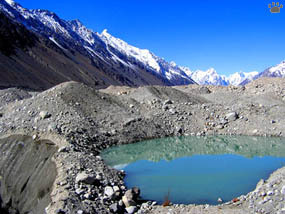 Unlike the plains of Pakistan, which are now almost devoid of wildlife, the mountains still contain rare animals such as snow leopard (Panthera uncia), Tibetan brown bear (Ursus arctos pruinosus), three species of wild sheep and three species of ibex. Lammergeyer (Gipaetus barbatus) and other vultures are still common at high elevations, but are almost extinct in the plains due to pesticide poisoning. 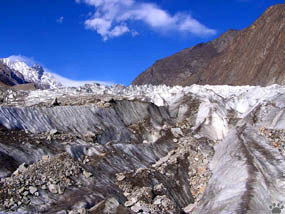 Batura Glacier is 36 km long. 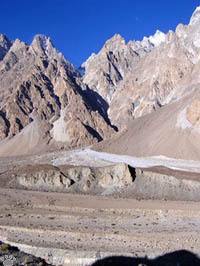 Edge of Batura Glacier. 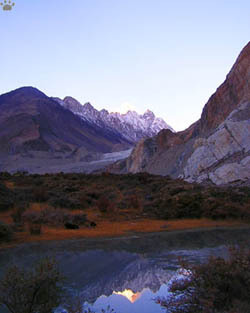 Further down the road, a few large glaciers closely approach the KKH. 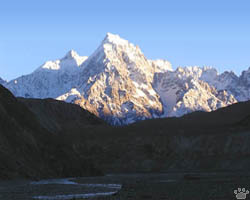 Their valleys provide access to remote parts of the Karakoram. 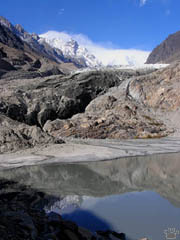 A small river emerges from a glacier. 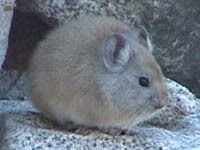 Pamir pika (Ochotona macrotis), Batura Glacier. 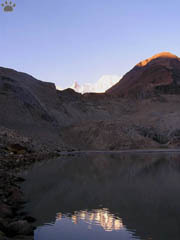 Walking up glaciers is neither easy nor boring. 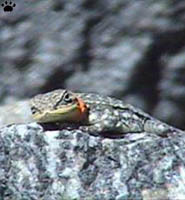 Even talus slopes and old morains are full of life. 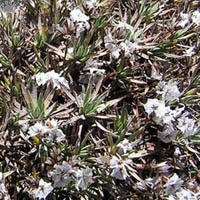 It takes a lot of hiking to get to really pristine valleys, but those little "alpine gardens" are worth the effort. 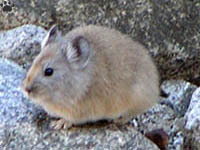 Ladak pika (O. roylei), Nanga Parbat. 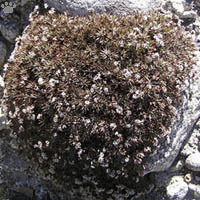 Kellerbergia alpina, Batura Glacier. 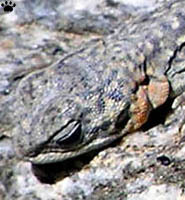 Closer to the Highway, all forests have been logged a long time ago, and all valleys are intensely grazed in summer. High-elevation plants might not look like much, but they are highly nutritious: even an emaciated cow would become fat here in two-three weeks. 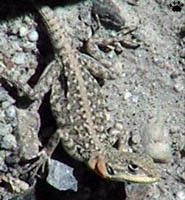 Himalayan agamas (Laudakia), Batura Glacier. 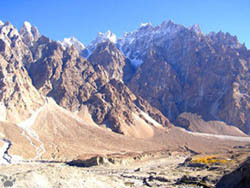 View of Passu Glacier from Passu village. 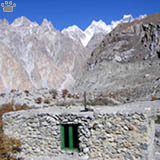 Passu, a small friendly village on the KKH, is a good base for exploring some of the best glacial valleys. 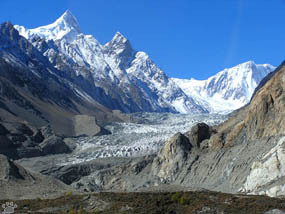 Three large glaciers are within an hour's walk. 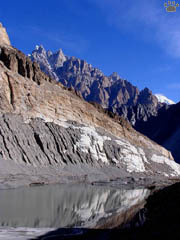 Lake on the terminal moraine, Passu Glacier. 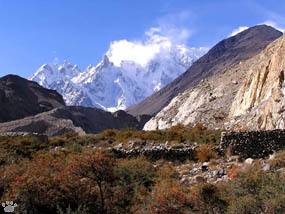 Passu Village and Tapodan Peak (6106 m). 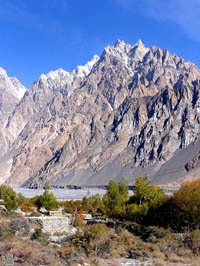 The village was partially abandoned after 1974 flood washed away most of its arable land along Hunza River. 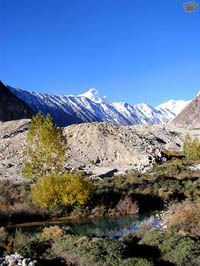 Valley of Hunza River near Passu. 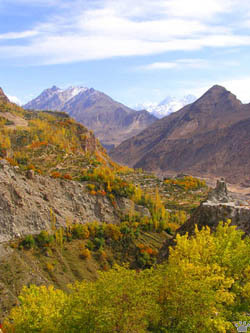 People here speak Wahi, one of Pamir languages related to Farsi. Urdu and English are also somewhat understood. 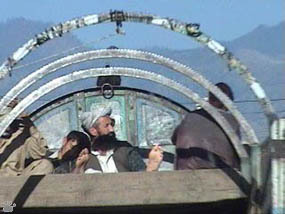 Traveling by truck, Karakoram Highway. 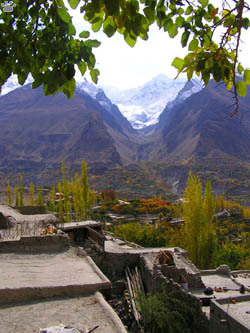 Karimabad village from Baltit Fort. 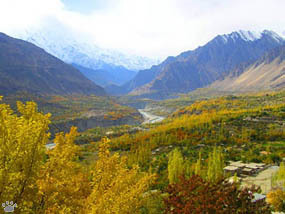 As you drive down the KKH, the views get less desolated and more colorful, until you reach Hunza Valley, by far the most charming place in Pakistan. 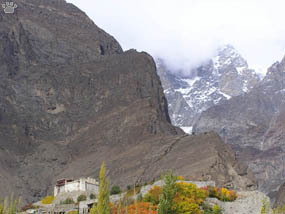 Altit Fort and the Lesser Himalaya from Baltit Fort. 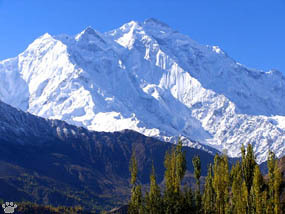 Rakaposhi Peak (7788 m) dominates the valley. 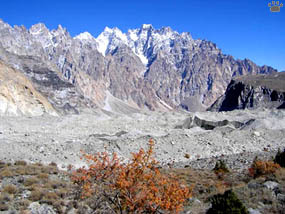 Unlike most other parts of the country, Hunza Valley is still popular among tourists. But the tourist season here is very short (June-July). In October, the weather is better, the fall colors are stunning, and there are no people in high valleys (the herds are already moving towards winter pastures). 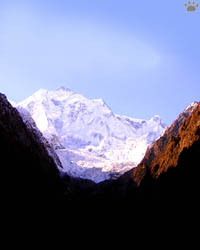 But for some reason, very few people visit the mountains at that time. 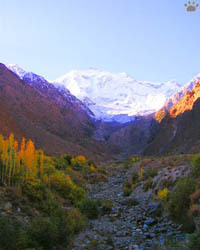 Fall colors below Rakaposhi Peak. 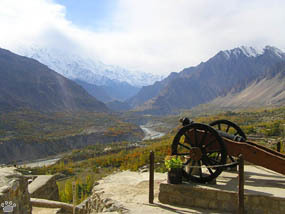 Views of Hunza Valley from Baltit Fort. 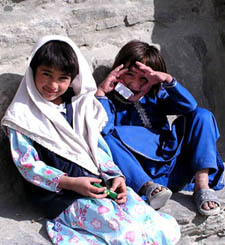 Local girls, Karimabad. 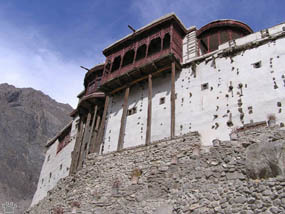 The ancient Baltit Fort is considered the Valley's main attraction. 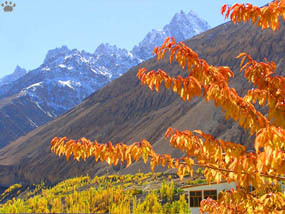 But what makes Hunza so nice is its people - as hospitable and fun-loving as anywhere in Pakistan. 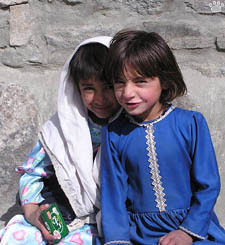 Most are Ismaili Muslims and speak a mysterious isolated language called Burushasku. 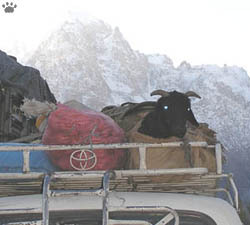 Goat traveling by bus, Gilgit. 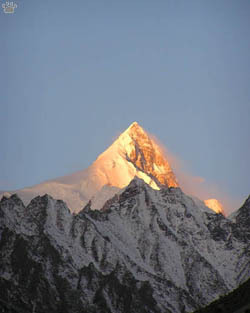 Soon, the KKH descends to Gilgit, the largest town in the area, and then follows Indus River into Indus Kohistan. 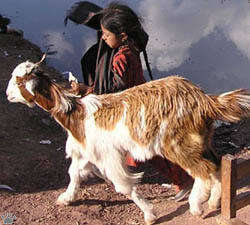 Goat traveling with a friend, Palas Valley.